It's no secret that I love games. I think I love games because I love stories and games are a kind of interactive story, even the simplest ones. Many of my fondest memories involve games, from video games to board games to the games that most of the world calls, in a very serious manner, sports. And I have to admit I've never been particularly engaged in sports enthusiasm when I didn't have some personal connection to the game, such as personally being on the team or having a sibling on a team. I was more engaged in my brother's little league team or my sister's middle school basketball team than I've ever been able to be in any university or professional game. I'm consistent about it, too; I may enjoy playing video games sometimes, but I'm nearly always bored to tears watching someone else play. But when I consider what are my favorite games, a list emerges too long to list here. Did I mention that I love games? I want to PLAY ALL THE GAMES. The only reason I haven't gotten into computer games and role-playing games is lack of sufficient equipment or lack of opportunity, combined with fear of my life being sucked out of my eyeballs and completely into a game world. At least books eventually end. Some of those online games appear to be constantly updated. And I have no self-control when it comes to stories. I tend to be a board-games kinda gal, but I'm mentioning role-playing games because I suspect that the years I spent volunteering at a living history museum was satisfying a kind of role-playing desire I didn't realize I had at the time. And because I want to tell you about Graces. "It derives its name from the graceful attitudes which it occasions. Two sticks are held in the hands, across each other, like open scissors: the object is to throw and catch a small hoop upon these sticks. The hoop to be bound with silk, or ribbon, according to fancy. The game is played by two persons. The sticks are held straight about four inches apart, when trying to catch the hoop; and when the hoop is thrown, they are crossed like a pair of scissors. In this country it is called The Graces, or The Flying Circle. Two people play this game. Each girl holds one stick in each hand. One girl crosses her sticks so they look like an open pair of scissors, and she put the hoop over the sticks. This girl flings the hoop toward her partner, and the partner tries to catch the hoop with her sticks. Play continues back and forth. The object of the game is to toss the hoop back and forth without letting it fall to the ground. This game is designed to teach young ladies graceful movements." Basically it's "Catch" with a hoop that you toss back and forth by pulling apart your two sticks at a smooth and even pace and aiming such that your partner can catch the launched hoop on her sticks and shoot it back at you. It's simple, but once you get the hang of how to launch and aim the silly thing, it can be quite a lot of fun. I suppose it may have been even more fun because when I was playing it, I was also playing at being 1830s farmgirl Lezolitta Rothentropp. Maybe it was particularly fun because it was a kind of game-within-a-game. But I have to say the kids that came through the village enjoyed it too, so perhaps it is truly fun on its own merits. I can't say I obtained any particular grace from playing graces, which is presumably the story of the game of graces. But maybe the story of graces is actually about how pretty colorful ribbon is when flying through the air attached to a wooden circle, or about how enjoyable it is to spend an afternoon in the sun tossing something back and forth with someone else. 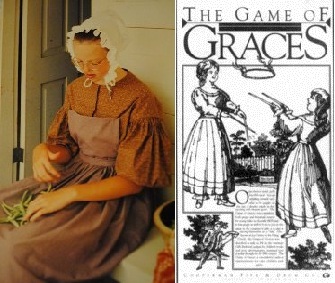 Maybe graces is the story of frisbee and catch and every other game played in the backyard or meadow with family or friends. This post is in participation with the Level Up! Blogfest organized by Jamie Gibbs of Mithril Wisdom and Allison of Geek Banter. "Games are an important part of living; otherwise life would be boring as hell. You might be a fan of video games, card or dice games, board games or even games you used to play on the playground as a kid. There's always a game that holds a special place with us."